“An incredible player came from Japan” a fan of the Los Angeles Angels said recently. The player is Shohei Ohtani. And he has gained a lot of attention since he joined Major League Baseball in America. Major League Baseball teams usually select a player to be a pitcher or a batter. Ohtani is special because he can play both at the highest level. Ohtani was already famous when he was in high school. Against the best pitcher in the high school national tournament, he hit a home run. Before turning 18, he recorded the fastest pitch in the history of Japanese high school baseball at 160 kilometers an hour. Very few major league pitchers in America can throw that fast. FILE - In this Nov. 19, 2015, file photo, Japan's starter Shohei Otani pitches against South Korea during the first inning of their semifinal game at the Premier12 world baseball tournament at Tokyo Dome in Tokyo. After high school, Ohtani was the first player selected by the Nippon-Ham Fighters, a Japanese professional team, in 2012. By 2016, Ohtani excelled as both a pitcher and a batter for the team in Sapporo. He hit 22 home runs as a batter and had 10 wins as a pitcher while striking out 174 opposing batters. As a pitcher, Ohtani also threw the fastest pitch in the history of Nippon Professional Baseball at 165 kilometers an hour. He then led the Nippon-Ham Fighters to the championship of the Nippon Professional Baseball league. At the end of every season in Japan, sports reporters choose the Best Nine. The award is given to the best player at each position in the league. Ohtani won the Best Nine award as a designated hitter and as a pitcher. And he also won the league’s Most Valuable Player Award. On December 8, 2017, Shohei Ohtani joined the Los Angeles Angels of Major League Baseball in the U.S. He chose the team over the well-known New York Yankees and Boston Red Sox. In his first three home games as the Angels’ designated hitter, Ohtani hit three homeruns. He became the first Angels rookie to do so. As a pitcher, Ohtani won his first game striking out six batters in six innings on April 1. Then, on April 8, he had a perfect game through six and one third innings before permitting a hit. In baseball, when a pitcher does not permit any runs, hits or errors, he is said to have pitched a perfect game. When he played in Japan, some Japanese fans compared Ohtani to Babe Ruth. Ruth is one of the greatest American professional baseball players. He began his Major League career as a pitcher for the Boston Red Sox but played in the outfield for the New York Yankees. Now, many people in the United States have started to compare Ohtani to Babe Ruth. Baseball is one of the most popular sports in Japan. More than 20 million people attend professional baseball games in Japan each year. 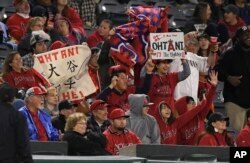 Now, Major League Baseball is getting more popular among Japanese baseball fans. One of the reasons is that more star Japanese baseball players, like Ohtani, are playing in the United States. Ryohei Takahashi is a Japanese baseball fan. He especially likes Major League Baseball. These days, he gets up very early in the morning to watch Ohtani’s games. He sometimes needs to wake up at 4:00 in the morning. There is a 16-hour time difference between Japan and the U.S. West Coast. Ryohei told VOA that he did not expect that Ohtani would be such a good hitter. He thought that the Japanese star might instead mainly pitch. But, “I am glad to watch his two-way success,” he said. Shunsuke Ijima, a Japanese university student, went to Anaheim, California. Shunsuke Ijima is a Japanese university student. He watched Ohtani’s near-perfect game in Anaheim, California. Japanese media have closely covered Ohtani and his games. When the New York Yankees played against the Angels in late April, they were hoping for a dream match-up between Ohtani as a batter against the Japanese pitcher Masahiro Tanaka. In his first time batting against the Yankees, the 23-year-old Ohtani hit a home run against pitcher Luis Severino. But he sprained his ankle later in the game. So, the dream match-up will have to wait for another day. Rei Goto wrote this story for VOA Learning English. Mario Ritter and Hai Do were the editors.